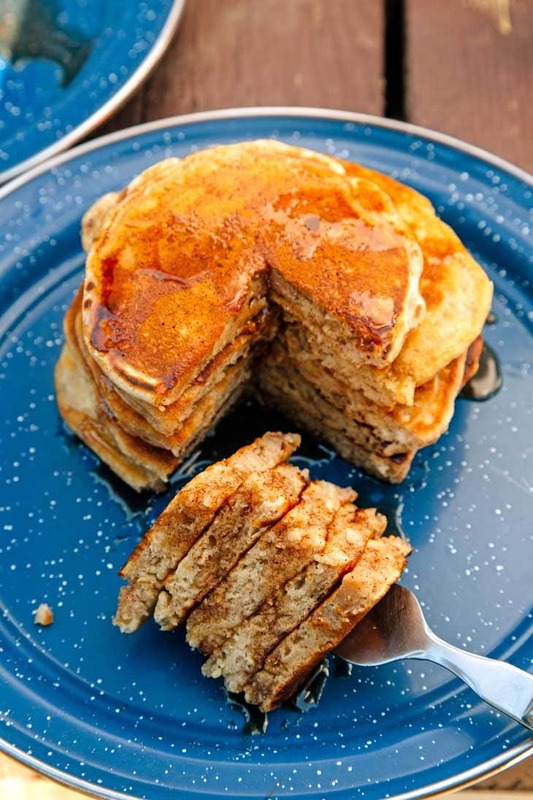 Embrace the season and enjoy a half stack of pumpkin spice pancakes. Fall is a time for Pumpkin Spiced Everything. There’s no question that this autumn craze can – and often is – taken to great excess (…pumpkin spiced Greek yogurt just shouldn’t exist). But when done properly and responsibly, a little pumpkin flavor can really enhance a meal. 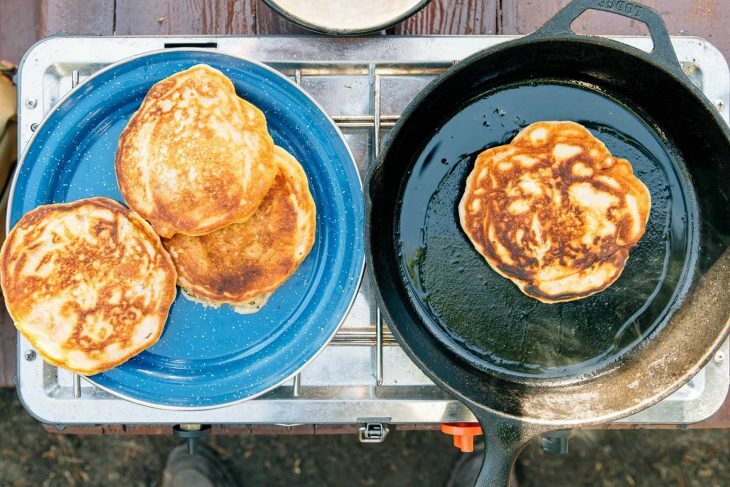 In terms of camping foods, pancakes seem like excellent candidates to be Pumpkin Spice-ified. 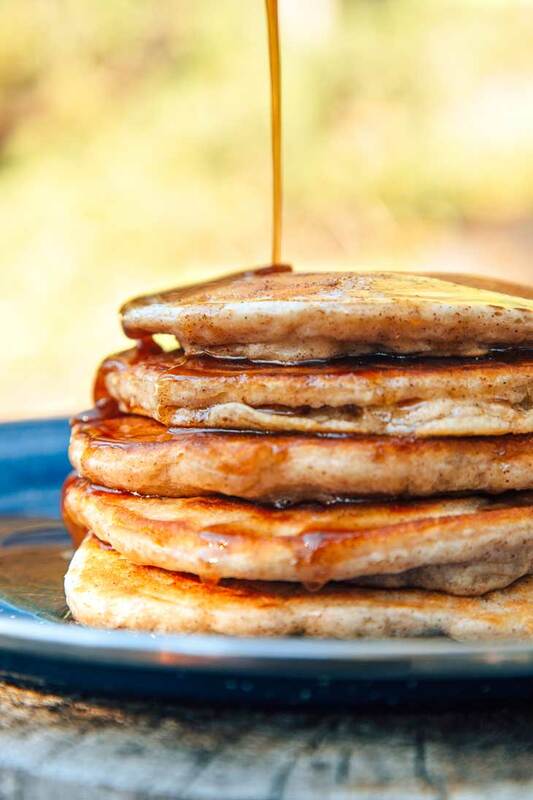 After all, pancakes mostly serve as vessels with which to transport other delicious flavors to our mouths (namely maple syrup and butter.) So why not add a little pumpkin flavor to the party and see how it goes? The first is to add a little pumpkin spice to the batter. This will produce mild pumpkin notes that subtly work in the background of your pancakes. The second is to mix some pumpkin spice into your maple syrup. The maple syrup will need to be warmed up for the spices to properly mix, but once they do, this will produce a pumpkin forward flavor that blends nicely with the sweetness of the maple syrup. Finally, if you really want to crank the pumpkin flavor up to 11, you can do both: batter and syrup. 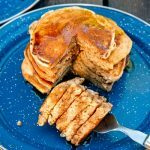 What better way to celebrate the season than to make these Pumpkin Spice Pancakes! 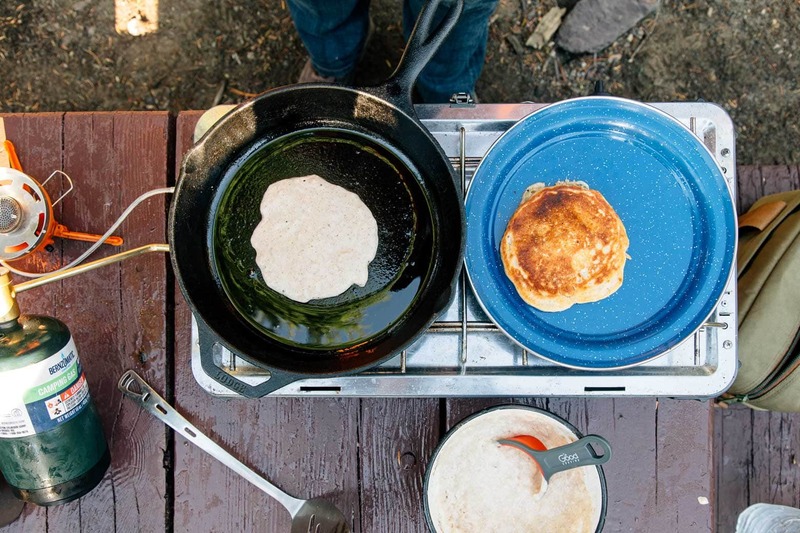 Simple ingredients make this a great recipe for camping or for an easy weekend breakfast. Combine the flour, sugar, pumpkin spice, baking powder, and salt in a medium bowl. Add the milk and egg to the dry ingredients. Using a fork, whisk to combine, making sure not to over mix. Heat a skillet over your campfire or camp stove over medium low heat. Add a teaspoon of butter, ghee, or oil to the skillet and swirl to coat the pan. Pour ⅓ cup of the pancake batter into the center of the skillet and cook for a few minutes until the top begins to bubble and the sides are set (2-3 minutes). Using a spatula, flip the pancake and cook the other side until golden. Repeat with the rest of the batter, adding more fat to the skillet as needed. Serve with Spiced Maple Syrup (recipe below). Combine the syrup and pumpkin spice in a small saucepan and gently heat, stirring frequently, until the syrup is warm and the spices have been incorporated. The dry pancake batter ingredients can be measured out at home and stored in a sealable container or bag. Mouth watering Pancakes !! Loved the Post. I will surely gonna try it out. Just perfect recipe for those who love eating pancakes. My daughter is watching these videos and cooked her very first pancake tower from it – thanks for the inspiration. I like the sound of this but would need to convert it into a more Paleo, gluten free version. Thanks for sharing. We are actually split on the idea of pumpkin spice yogurt. Michael (who wrote the post) is in the “no thanks” camp, but I (Megan) agree with you that it sounds pretty good!! There are a few recipes online for DIY pumpkin spice blends (usually cinnamon, cloves, allspice, maybe nutmeg?) that you could try using instead!